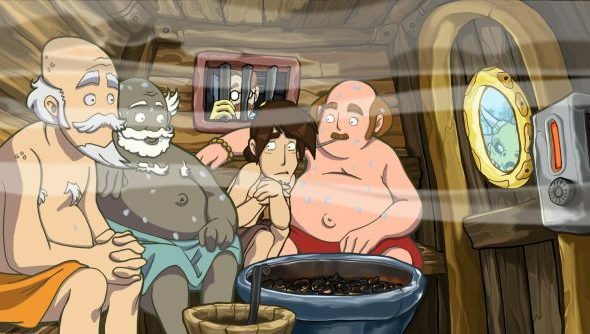 The latest entry in the Deponia series of adventure games released yesterday. Doomsday starts just after series protagonist Rufus wakes up from a dream of destroying the eponymous planet by blowing it into lots of tiny, tiny pieces. He then decides that hey, maybe that wouldn’t be such a great idea, and sets out to try to stop this prophetic dream from ever taking place. Try out the other end of the gaming spectrum in the best FPS games available. As with all good stories, it turns out that a time travel machine is just chilling out in Rufus’ figurative backyard. With the help of a scientist named rather on the nose as McChronicle, they set out to save their junk-heap world from destruction. Expect comedy, and if I’m reading this right then platypuses, along the way. It’s on the 10% launch discount on Steamcurrently, making it just £21.59/€26.99/$26.99 until next week. The original trilogy, which you will probably need to have played to get the full appreciation out of this one, is also available.